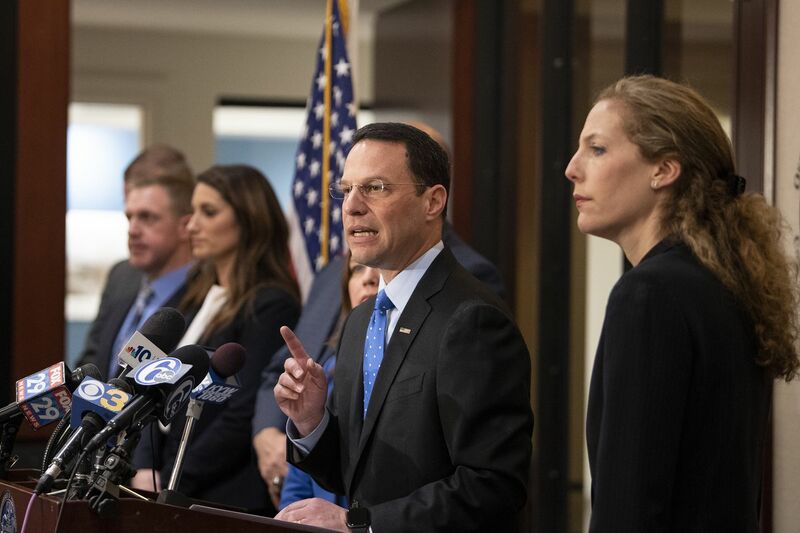 Pennsylvania Attorney General Josh Shapiro announced charges against the operators of Liberation Way, a Bucks County drug treatment center, during a press conference at the Attorney General's office in Philadelphia Monday. The cofounder of a Bucks County drug treatment company and 10 others have been charged in a wide-ranging fraud scheme that, state officials say, trapped patients suffering from drug and alcohol addiction in a cycle of ineffective treatments and near-inevitable relapse — all as the company made tens of millions of dollars off insurance reimbursements and kickbacks. The Pennsylvania Attorney General’s Office charged Jason Gerner, the cofounder of Liberation Way, with fraud, conspiracy, and related offenses. Other high-level executives, including Branden Coluccio, the chief financial officer and co-owner; Domenick Braccia, the center’s medical director; and Michael Armstrong, the chief networking officer, also were charged with fraud and conspiracy. Liberation Way, based in Yardley and founded in 2015, had been under deep scrutiny for some time. A year-long investigation by the Reading Eagle found found repeated violations of state regulations -- during some inspections, more than any other program in Berks, Bucks, Montgomery and Chester counties. Employees told the Eagle they had long noted what they called a “revolving door” of patients who would enter the program, relapse, and reenter. That, state officials said, was by design. “They used these people for all they were worth,” Attorney General Josh Shapiro said at a news conference on Monday, “and that worth was defined by insurance benefits. I cannot overstate how complex and appalling this case is, in light of the opioid crisis ravaging Pennsylvania." More than 5,400 people died of drug overdoses in Pennsylvania in 2017. In Philadelphia, 1,217 people died of overdoses that same year; an estimated 1,100 people fatally overdosed in the city in 2018. A grand jury charged with investigating Liberation Way wrote in a presentment released Monday that the treatment centers’ patients largely lived at “sober homes” affiliated with the company. At these facilities, patients were poorly supervised and, the grand jury wrote, housing staff and employees engaged in sexual relationships with patients. Some homes were in areas known for “nefarious activity," the grand jury wrote. One sober home in North Wales was known as “the party house." The grand jury wrote that it was owned by Braccia, the medical director, and leased to Liberation Way, but later sold to a company called “1146 Stump Road LLC." The company paid for the house with a check from Liberation Way’s bank account, signed by Coluccio, Liberation Way’s CFO. Muhammad Abdul-Hadi, a Philadelphia man who ran housing associated with Liberation Way and had invested in the company, was also charged on Monday. Many patients, the grand jury wrote, believed they were required to live in Liberation Way-affiliated housing, even though the company was not licensed as an inpatient treatment facility. In such an atmosphere, state officials wrote in a news release, relapse was not only common, it was expected. Patients would fall back into addiction, and then return to Liberation Way for more treatment — often at a higher level of care that meant the company got larger reimbursements from insurance companies, the grand jury wrote. “Liberation Way cycled patients through the treatment process as many times as possible,” the grand jury wrote. “Some patients were cycled through treatment at Liberation Way up to eight times. Once a patient’s benefits were exhausted, Liberation Way transferred the patient to another treatment center." Blue Cross Blue Shield companies, whose local branch is Independence Blue Cross, the largest private insurer in the Philadelphia region, were overbilled $17 million, Shapiro said. Liberation Way was also charged with running a kickback scheme with a Florida lab analysis company. Patients’ urine was tested for the presence of drugs multiple times a week — sometimes multiple times a day. Samples were sent to the lab in Florida, which would bill insurance companies for the tests. A doctor consulted by the grand jury said many of those tests were medically unnecessary, and the grand jury wrote that Liberation Way staffers were offered cash incentives to collect as many urine tests as possible in a given week. Gerner and cofounder Dallas Fetterman, who died of an overdose in 2017, were paid a portion of the insurance companies’ reimbursements — hundreds of thousands of dollars’ worth, state officials said. Jesse Peters, an associate of the Florida lab company, was also charged by the Attorney General’s Office on Monday, as was Ramesh Sarvaiya, a New Jersey doctor who allegedly signed off on millions of dollars worth of urine testing without seeing any patients at Liberation Way. Those two are also facing federal charges, authorities said Monday. The Attorney General’s Office said Gerner and Fetterman made $44 million in profits from insurance companies. When the company was sold to a private equity firm in 2017, six months after Fetterman’s death, it fetched a $40 million payday for its owners and investors. Liberation Way’s listed phone number has been disconnected, and its website is no longer functioning. Attempts to reach defendants charged in the case were unsuccessful. The suit was settled in two weeks, said Missy Orlando, a spokesperson for CityLine Behavioral Healthcare, the firm’s behavioral health division. Orlando said the company had “absolutely no knowledge” of the alleged scams and “applauds” Shapiro’s decision to bring charges against Liberation Way’s former operators. She added that Liberation Way’s Yardley headquarters have been gutted, and that the two other facilities it operated, in Fort Washington and Bala Cynwyd, were renovated and folded into CityLine’s treatment programs. The executive director of those programs is a licensed clinical social worker with a master’s degree in social work, Orlando said. Two of the sober houses affiliated with Liberation Way are still operating, including the North Wales house once known as the “party house." But they are no longer co-ed facilities, as they were under the previous ownership, and are under supervision, Orlando said. “Except for the fact that it’s the same physical structure, everything else is completely different,” she said.